Co-designed with American music legend Bob Weir, the all-new Bob Weir Premier SS is a landmark addition to his legacy of innovation. Featuring a compact tremolo system for maximum performance, push/pull tone knobs for coil tapping, and a master volume knob for total control, the Bob Weir SS offers remarkable versatility. Available only in the all-new Stone custom finish, with a full centerblock for sustain and resonance. 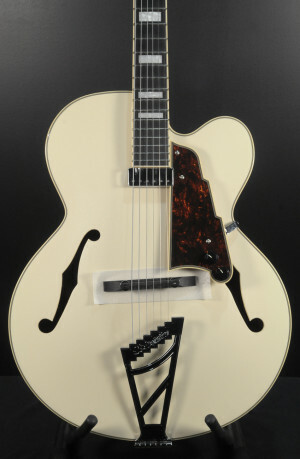 Let me help Sing your blues away with this new D'Angelico Special Edition Grateful Dead DC Hollowbody guitar. This Guitar is sure to have any Deadhead Dancing in the streets. The top features a custom paint job showing off the red, white and blue Lightning bolt from the iconic Steal your Face logo that is as beautiful as any sunshine daydream we've ever seen. When push comes to shove, don't let yourself feel like you've been left out in the Cold Rain and snow, this could be the last time so get your crazy fingers on this guitar and ride the dark star as it crashes into the promised land because the music never stopped. So grab this guitar while you can and show your love for the Dead. This guitar plays great, and sounds fantastic. Comes with a deluxe gig bag.